More than 60 years after her death from cancer at age 33, Argentine political figure and international icon Eva Perón will return to life for three days when Eastern Regional High School Theatre debuts this year’s spring musical “Evita” on March 17. “Evita” follows Perón on her rapid ascent from impoverished beginnings, to her work as a radio star and film actress, to her eventual transition to the political sphere with her marriage to Argentine president Juan Perón and her work to improve the wellbeing of Argentina’s poorest. And perhaps this year Eastern has no student more fitting to star in the show’s titular role than junior Bridgette Burton, who admittedly idolizes actress Patti LuPone, who famously won her first Tony Award for Best Actress in a Musical by playing Perón in the original Broadway production of “Evita” in 1979. With Andrew Lloyd Webber’s Latin, pop and jazz influenced score, the show contains almost no lines of dialogue, with the story instead told almost entirely through song. Yet despite the challenge, Burton said the cast is doing a great job preparing for opening night, and she herself is excited to try her hand at such a well known role. Burton said Perón’s story of starting from nothing to become such an influential figure, while doing what she wanted to get where she wanted to be, makes her a fascinating role to play. “Even though it’s a dramatization of her life, I think she’s very well reflected in the way the show is written,” Burton said. Director Dr. Gregg Molotsky also echoed the difficult nature of the show, but said with such wonderful music it was definitely a challenge Eastern Theatre wanted to take on. “Certainly the lead role requires a lot of vocal ability, so it’s a matter of conditioning the kids and training them vocally — it’s not a typical bubblegum pop musical like ‘Grease,’” Molotsky said. However, Molotsky said the students have been working hard and the public is going to see a classic Broadway musical and one with themes still relevant today. “It’s about a woman’s rise to power and the politics of women’s rights and making sure the workers get fairly compensated, which are topics that are still relevant in today’s political environment,” Molotsky said. Eastern junior Gary Bowman, who is playing the show’s narrator Che, agrees. “It’s a really interesting concept to see how a girl that was put in so many different positions and faced so much opposition from the men that were “above” her just overcame everything they told her she couldn’t,” Bowman said. 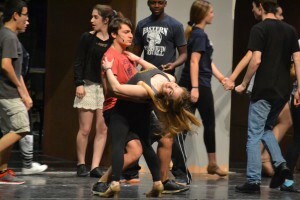 Senior Alec Pizarro, who has the role of Juan Perón, praised Burton and Bowman, and said he believed “Evita” would be one of the best shows Eastern Theatre had produced in at least five years. 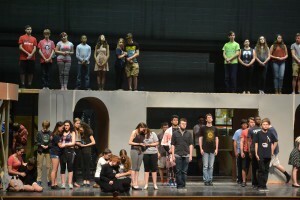 “Evita” will be performed at the Eastern Center for the Performing Arts, 1401 Laurel Oak Road, on Thursday March 17 at 7 p.m., Friday March 18 at 7:30 p.m, and Saturday March 19 at 2 p.m. and 7:30 p.m.
Tickets will are available at http://eccrsd.booktix.com/ for $11 or for purchase at the door for $13.